Once approved for Premium distribution, your Smashwords ebooks will be available on Barnes & Noble, Kobo, Apple, Page Foundry, Baker & Taylor, Gardners, Blio, txtr, Library Direct, Baker-Taylor, Axis360, OverDrive, Scribd, Bibliotheca CloudLibrary and Odilo. While on SEO, you will have a link on your publisher’s dashboard for every ebook, with a list of SEO entries for each title and author. 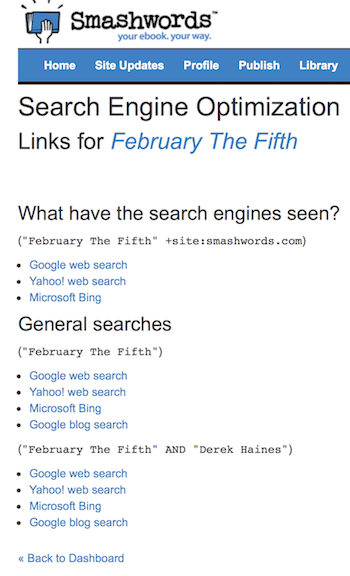 You get your book and author name indexed on search engines by publishing your ebook on Smashwords. Again, it is more exposure which is good book marketing for indie authors. It is a hassle when they ask for a special format such as mobi, epub or pdf. You can also download a 10% preview read. It is convenient if you want to offer a free download of your ebook on your WordPress blog or website. All you need to do is log in to your Smashwords account, go to your Dashboard, and click on the book title.